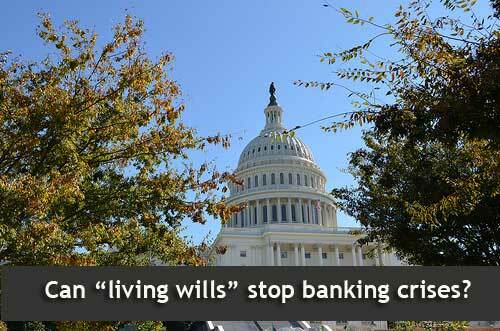 Can Living Wills Prevent Another Banking Collapse? People make living wills – and now, so do banks. To prevent a major financial meltdown like the one that hit the country in 2008, major US banks are now required to create a contingency plan for failure and submit it to government regulators. But because those regulators haven’t been monitoring those “living wills,” the safety net protecting consumers from another crisis is still full of holes. In an attempt to prevent more scenarios like this, the government stepped in, passing the sweeping Dodd-Frank Act in 2010 to impose more accountability on the banking industry and protect consumers from predatory practices and their own bad judgment. Among the many requirements of the Act was the “living will” mandate. The country’s biggest banks, including Bank of America, Citigroup and JP Morgan Chase, had come under investigation by the US Justice Department and various state attorneys general for wide ranging fraud and mismanagement that put millions of homes into foreclosure nationwide as well as other financial crimes affecting not just domestic but also international financial activities. But because those banks were the linchpins of the country’s financial structure, a collapse, either due to bankruptcy or illegal dealings, remained unthinkable. They were still too big to fail, which meant that anther crisis would require more bailouts at taxpayer expense. So the Dodd Frank Act required each of these large banks as well as a few other heavy hitters in the financial world to create a detailed plan describing what would happen to the company in the event of a complete collapse. That plan was to be filed with designated government regulators — the Federal Reserve and the Federal Deposit Insurance Corporation, better known as the FDIC. The job of the Fed and the FDIC was to conduct periodic “stress tests” that would determine whether financial institutions were healthy. One job was to review these plans annually and notify their creators of any shortcomings. Banks were supposed to amend the plans to accommodate the Fed’s recommendations until the plan was deemed credible and viable. And if they didn’t? The Dodd Frank Act also includes a mandate for regulators to seize and forcibly dismantle stubbornly non-compliant institutions and either kill them entirely or recreate them as smaller entities. This would prevent the need for massive and unpopular bailouts to keep those struggling, and shady, financial giants afloat. Four years later, none of that has happened. The banks, chief among them the perennial banking bad boy Bank of America as well as its cohorts Chase and Citi, have filed living wills. They were followed by other big financial entities including Prudential and American International Group. But the Fed and the FDIC have yet to respond. The whole topic became a sore point in recent US Senate Banking Committee hearings, when new Fed chair Janet Yellen blamed her agency’s foot-dragging on a complex documentation process and altogether avoided the question of the mandate to forcibly break up malfunctioning institutions. The lack of response from the Fed on the entire “living will’ aspect of Dodd Frank worries a number of financial experts. They fear that even if the institutions comply with Dodd Frank and file plans as required, those plans are largely meaningless without timely feedback from the regulators. What’s more, banking experts say, the reason the Fed is avoiding questions about the mandate to take charge of troubled institutions is that it doesn’t really have any plans of its own in place to address how to do that. If true, that means government regulators have no power to require banks to create credible plans and act on them if necessary. This creates a situation, they say, that leaves the country vulnerable to another banking collapse like the one five years ago, with megabanks on the verge of collapse and a taxpayer funded bailout waiting in the wings because Dodd Frank’s provisions couldn’t be enforced. For “taxpayer” read “you” – the ones already paying higher banking fees as large banks pass on their legal costs to customers.